Shopping for Disney Key Chains? Carry around an adorably stylized version of one of your favorite characters from the Disney universe! This Disney 3-D Series 3 Figural Key Chain 6-Pack comes with 6 individually blind packaged figural key chains. 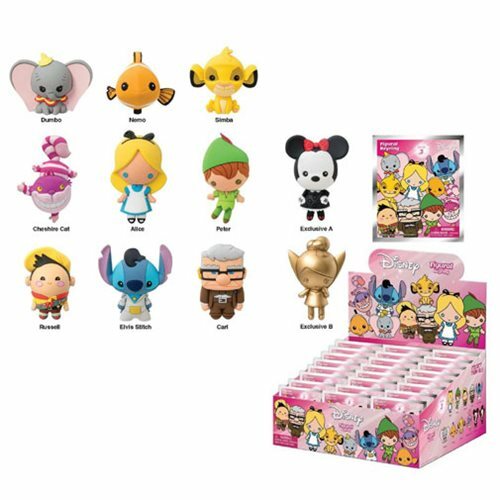 You could get Dumbo, Nemo, Simba from The Lion King, Alice Liddle and the Cheshire Cat from Alice in Wonderland, Peter Pan, Stitch from Lilo and Stitch dressed up as Elvis, Carl and Russel from Up, or even rare chase versions of Minnie Mouse or a faux bronze Tinkerbell! Ages 4 and up.